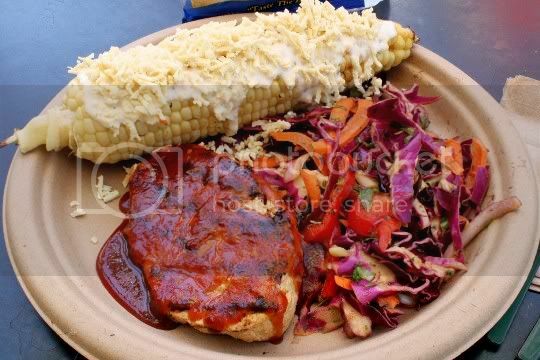 Nothing says "summer" more than eating a plate full of BBQ on a warm, sunny, beautiful day...and the folks over at Whole Foods 3rd and Fairfax really made that happen! 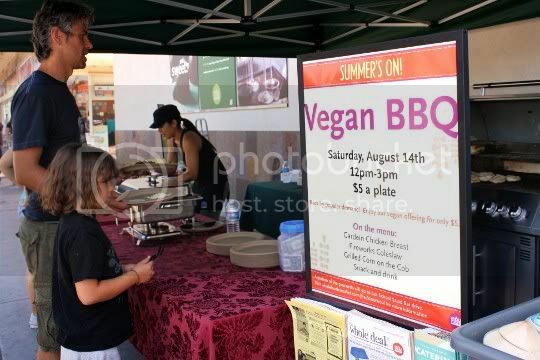 We're talking real BBQ-picnic-checkered-tablecloths kinda food: all vegan, and all for only $5 a plate (! ), which was QUITE a deal for such a generous portion of food. 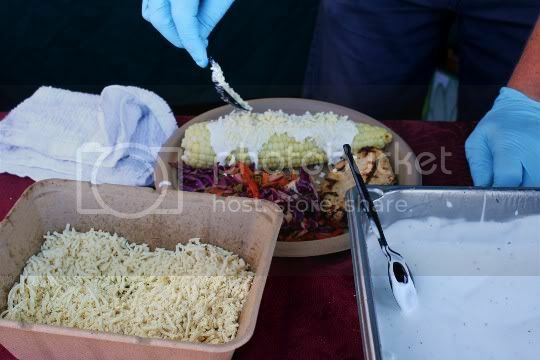 This event's menu featured a grilled Gardein chik'n breast with three different Sauce Goddess products to choose from, Fireworks Coleslaw, Grilled Corn on the Cob, a bag of chips, cookies, and a bottled water. 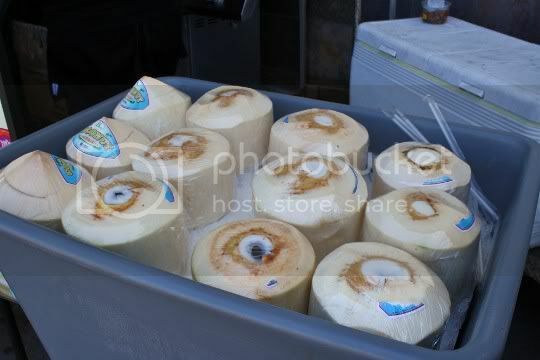 To add to the summer vibe, there were even fresh coconut waters available for purchase for only $2 (I actually kept the shell and had a nice snack of fresh coconut meat after). 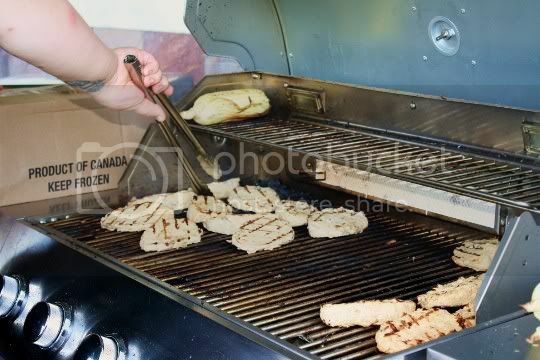 The grilled Gardein was great, as usual...but it was absolutely AMAZING slathered in BBQ sauce. 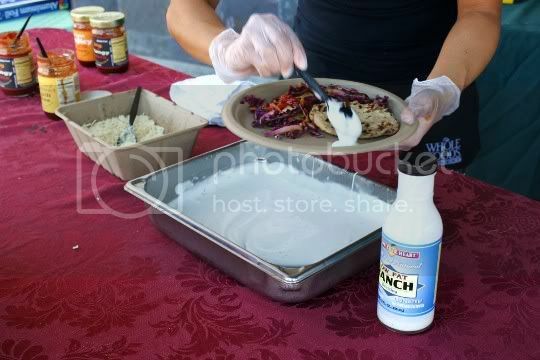 The available sauces were Sweet & Spicy, Sticky Sweet, and Big & Tangy. They were all delicious (and samples were offered of each one! 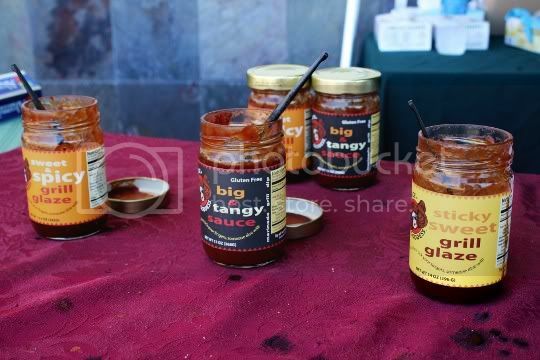 ), but I chose the Sweet & Spicy: sweet and spicy yes, but also tangy, light, fruity, and smoky. It was great paired with the savory and hearty Gardein. 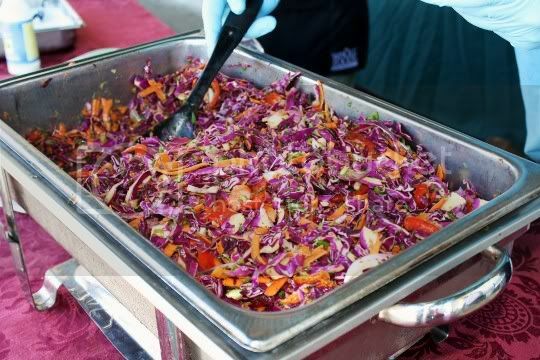 The coleslaw was also great and perfect for summer. Consisting of shredded red cabbage, sliced red bell peppers, shredded carrots, and sliced red onion, it was fresh, crunchy, sweet, and tangy. The perfect chilled side dish, and a great way to show that your veggie sides don't always need to be green to be healthy and tasty. I mean, just look at those beautiful colors! But perhaps my biggest surprise was the grilled corn on the cob. Seriously, this was probably the sweetest and juiciest ear of corn I've ever had in my life. Better yet, it was topped with Follow your Heart Organic Creamy Ranch Dressing and shredded Daiya mozzarella. My experience with eating Daiya raw (as opposed to melted) hasn't been life-changing, as so many insist...but paired with the Ranch dressing and sweet corn, sheesh I could eat this every day! Creamy, salty, savory, sweet...the ultimate comfort food. 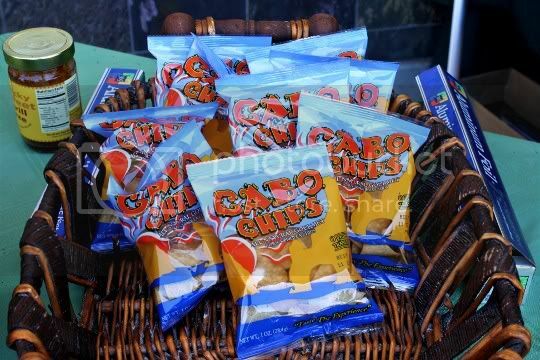 A small bag of Cabo Chips was also provided. These don't taste like your standard corn tortilla chip. They're very savory and salty, but umami-like salty (surprise ingredient: soy sauce), and also tangy with lime and lemon juice. They're thick-cut, non-greasy, and good for crunching. With the rest of the stellar meal however, they paled in comparison. Take 'em or leave 'em, meh. I think this was the last official "summer" BBQ event (before Whole Foods' big 30th anniversary celebrations kick off), so I'm super excited I went. It was a perfect menu and perfect weather, followed by a perfect plate-cleaning. Thanks guys! FYH ranch is not vegan though. What the heck. Oh wow...thanks for the info, I'll alert them.